On August 31st the Finnish melodic death metallers of Omnium Gatherum released their new album, called The Burning Cold. DutchMetalManiac’s Julia Obenauer already reviewed it here. As you can read below she also interviewed Omnium Gatherum’s guitarist Markus Vanhala. Hey! Could you briefly introduce yourself and your band? Hey DutchMetalManiac, I’m a Finnish small town maniac called Markus Vanhala and I play guitar in melodic death metal mob Omnium Gatherum and we just released a new album called The Burning Cold that you’ll definitely need in your life! Congratulations on The Burning Cold, it’s a very impressive album and I liked it a lot! Could you tell us a bit about the album production process? Thanks, we do like it too and I could easily say it’s my favorite Omnium Gatherum album together with 2013’s Beyond. Basic OG project approach is that I write a lot of music, Jukka writes all lyrics and Joonas comes up with a riff or two, then we start to send files to each other and everyone spices the soup with own ideas. This is when the cover artwork artist Olli Lappalainen listens the demos and starts to illustrate the music onto cover art form. For audio capturing we used our trusted guys since already many years and many albums, Teemu Aalto for engineering and Dan Swanö for mixing and mastering. It’s good to keep the art things in the family, on this small band of brothers. How long did it take it to get the whole album done? It’s been only two years since Grey Heavens, so it seems like you’re in a very creative phase as a band right now. Do you feel the same? Seems so, we love doing this thing and touring with each other, so I guess it ends for this kind of activity. Which we can call “Creativity”. 🙂 Even while we’re an old band, we’re still very much into doing this and try to always beat our previous works and aim for the better. It’s always been that we never got any overnight-success, but our path have always been upwards with every release, so of course that also still feeds the hunger for this! How did you approach the songwriting? Creative process is something magic and for this day I still haven’t found the code for breaking this magic. There’s certainly a good dose of “writers block” after every album and during those I always feel I’ve lost the ability and touch to compose anything decent. But pushing yourself you always usually win this block in the end and creative juices starts to flow via your brain to the guitar fretboard. Just doing it, and being honest to only myself and try to please my own taste and goals. I guess that’s my approach. I usually work musical song demos pretty ready on my home studio before presenting the ideas to my dudes.. Saves time and gives a real view to the idea for others. In my opinion, while you guys still kept true to your signature sound, there are some new nuances and little twists to the songs that show a musical evolution. What do you think about that? For this album I really wanted to concentrate on doing compact and catchy songs. Death metal made in a poppy way, with listener friendly song structures. Though, not losing the bands spirit, which have always been a bit progressive metal vs. melodic death. Keep it very melodic but still not to lose the edge of aggressive deathly metal. It wasn’t the easiest task to combine, but I think we did pretty well with this! Which bands inspire you as individual musicians or as a band, and why? Death, Type O Negative, (old) Iron Maiden, Journey, Emperor, to name a few of my all-time favorites. They make good songs, and have their own distinctive style and sound, and are good musicians doing their best on their particular bands. The Finnish metal scene is quite big, and I read somewhere that you guys actually have the highest count of metal bands per capita in the world. Is there a lot of interaction and support between the different bands? There are a lot of well-known bands from Finland, but which more underground bands can you recommend? The Finnish old legends Tarot, band of Nightwish’ Marco Hietala, and Stone old band of ex-Bodom guitarist Roope Latvala. And of course Stam1na, the Finnish band we toured with last year, who are huge in Finland but nobody knows them abroad. These three are some Finnish classics that not so many people abroad know at all.. There’s not that many new metal bands emerging from Finland at the moment, so waiting the next wave to happen. Can you imagine doing tracks, or even an entire album, in Finnish? Why (not)? I saw that you have quite a bit of touring in support of the album ahead of you, which will take you to North America and Europe. Are you already excited about it? Which locations do you like to play the most? If I would have to pick two craziest audiences where I’ve played, I would say Tokyo and Montreal as first places coming to my mind. It’s always been crazy good out there! Though, good gigs varies and it can happen anywhere. It doesn’t have to be a big audience or big place or festival, it’s a state of mind. State of band community mind! Any funny stories from on the stage or on the road you feel like sharing? There’s too many to mention, and too blurry to remember haha 😉 Only thing coming to my mind for now is that we have a competition in this band to lose your passport abroad. 3 have goals already. Pink pass. We’re coming soon to your country, to Rotterdam Baroeg to be precise, as also Belgium nearby. So hope to see all you metalheads there! Thank you for doing the interview with DutchMetalManiac! 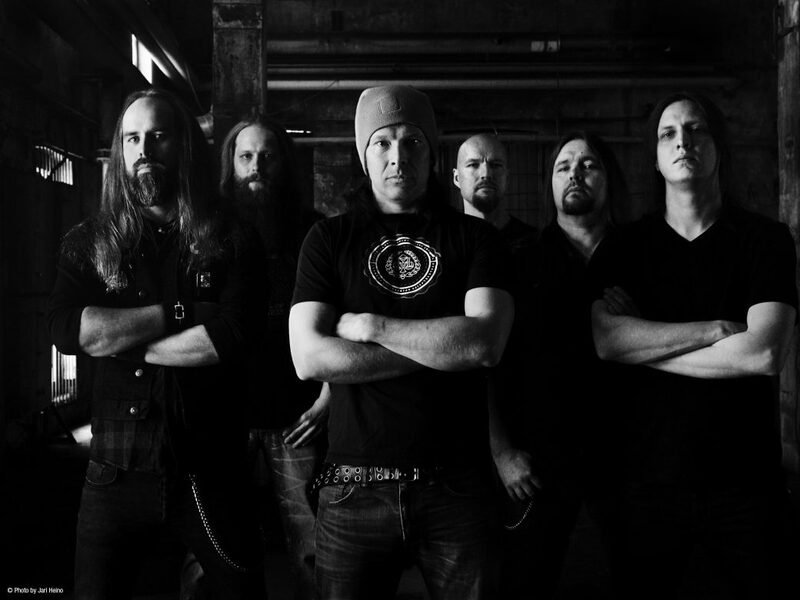 You can also read three live reviews we did that included Omnium Gatherum here, here and here.